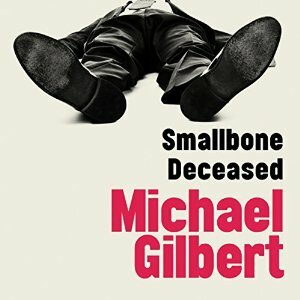 Somehow I had managed to never hear of Michael Gilbert until I downloaded copies of both the Mystery Writers of America and UK Crime Writers Association top 100 crime novels lists last year. SMALLBONE DECEASED is on both lists and I can see why. It is quite delicious, especially in the audio version delightfully narrated by Michael McStay. On one level the book is ‘just another’ puzzle that could be difficult to distinguish from a thousand other whodunnits. But what set it apart for me was its black humour and astute observations of human behaviour. And although it takes place 65 years ago, and bears some hallmarks of its vintage, it has a timeless quality that many other ‘classics’ fail to achieve. Although some specific details are wedded to its time and place, references to everyone’s wartime service for example, the relationships and office politics depicted were easily recognisable to me. And that puzzle is fiendishly well constructed too. The novel opens at a staff dinner of the law firm of Horniman, Birley and Craine. Henry Bohun is a newly qualified, just hired lawyer who provides a handy point of exposition for both writer and reader. Through him we meet all the key players for events which follow and most, but not all, of the action unfolds from his perspective. The most dramatic of these events is the discovery of the body of Marcus Smallbone, a trustee for one of the firm’s trust accounts, which has been crammed into a tightly sealed Deed Box for some weeks. Restrained mayhem ensues. Because he is too new to the firm to be a suspect, and because the police Inspector assigned to the case knows of him (and his odd ‘condition’ about which I shall say no more) Henry is allowed, encouraged even, to participate actively in the investigation and he’s an enjoyable character to travel with. He’s clever, interested and witty and his physical quirk adds a nice point of whimsy (I wonder if it’s a real thing, I deliberately haven’t googled it because, honestly, that does rather take the fun out of wondering). I didn’t confirm it until after I’d finished the book but I was not surprised to learn Gilbert was a lawyer. The details of life in the office and the various tricks that people in that profession could, at least theoretically, get up too seemed all along to be coming from the mind of someone with direct experience of that life. I couldn’t help but ponder which of his own clients he’d stuffed into a Deed Box by proxy. As someone who has spent a good portion of her working life organising people and their business I was quite thrilled to come across a book in which this usually ignored activity takes centre stage (the firm’s business is organised according to the Horniman system, named after the founding partner and playing a key role in the crime). But I don’t think you need my particular insight to enjoy this terrific novel. For once I agree with the list-makers, SMALLBONE DECEASED is a fabulous example of the classic detective novel: a plot full of surprises and red herrings, sharp-witted investigators and a satisfying resolution. This entry was posted in book review, Crimes of the Century, England, Michael Gilbert and tagged Crimes of the Century. Bookmark the permalink. I’m sure that I’m in the minority, but I really struggled with this when I tried to read it last year and had to give up. It’s a shame, because it sounded like the kind of setup I’d normally go for, but something in the writing really didn’t work for me – doubly surprising as I’d loved Gilbert’s The Danger Within (a.k.a. Death in Captivity), about a murder in a PoW camp during World War 2, and so was anticipating ripping through this. Ah, well, such is the subjectivity of reading. I like to think I’ll come back to it, so you never know. Death in Captivity is a book I’d absolutely recommend if you’re thinking of checking out more of Michael Gilbert’s work, though (and there’s plenty more to go in with after that!). Thanks for the recommendation, I’ll definitely be checking out some more of his work. Oh, imagine how terrible it would be if we all agreed all the time…yeesh, I can think of little worse. What would we do to fill the time? I mean, sure, there would be no war or bigotry or persecution, but what would we do??? I like Michael Gilbert’s work, Bernadette, so I’m very glad you enjoyed this one. In my opinion, he’s one of those authors who doesn’t always get attention, particularly not these days, but has done some very solid stuff. A fine writeup — thanks! I love this novel, and must have read it four or five times. The odd thing is that, betweentimes, I always manage to forget the whodunnit part of the book: the novel itself, the circumstances and the quasi-magic of Henry’s “condition” (as you put it) seem to fill up all my memory-cells! I think there was a Henry Bohun sequel, but I can’t for the life of me remember what it was called. I’m ashamed to say I’ve never heard of him but your review makes him sound well worth a read. I’m also very curious about Henry’s ‘condition’! Very glad you liked this. I have been meaning to read it for a while and I will push myself to get to it soon. I second JJ’s opinion of The Danger Within. It is based on the author’s experiences in the war and very very good. Alas (?) one of my personal goals is not to buy books from non-Australian book stores. At least that way when my local indie store closes due to Jeff Bezos owning the world I will be able to say I tried. I make good use of my local library and a couple of second hand dealers as well as the indie store so I can usually find what I want but I have to be patient. I should have added I also do allow myself to buy audio books from Audible because there just isn’t a local alternative and I do so enjoy being read to. Audible actually record a lot of classic genre fiction that is out of print so I can sometimes find things that way. I wholeheartedly approve – where possible, I buy my physical books from the last remaining book chain in England because, well, it’s good to suport what’s important, and book shops are very important! Where not possible to get it from Waterstones, I try to opt for Book Depository or alternatives (like straight from the publisher for the smaller ones) and make Mr. Bezos my final port of call. Of course, I do have a Kindle, so I’m not able to spurn him completely, but I like to think I’m doing my part. I love this book, and often think of it. As you say, the portrayal of office life is so good. I always remember: how to make money ‘sell the same thing twice’ – and the whole conversation with the unnamed and briefly-appearing burglar. And the explanation of the shopping habits of the young women in the office. All so real.